Best Buy Auto Equipment offers a broad selection of products that can help you improve efficiency and expand your service offering. We carry an assortment of motorcycle wheel balancers that can cater to a variety of motorcycle tire diameters. Our inventory includes only the best brands in the automotive business, including CEMB, Hofmann, K&L, Nationwide, Talyn, and many more. Our selection includes a wide array of configurations to suit any space. Plus, you can take advantage of free shipping on select products while supplies last. Shop from our selection today! This wheel balancer is accurate to within hundredths of an ounce ensuring wheels are balanced vibration-free. Top performing balancer at an affordable price. Comes standard with hood. Top performing balancer at an affordable price. This 2D automatic data set wheel balancer is accurate to within hundredths of an ounce ensuring wheels are balanced vibration-free. The iDEAL motorcycle tire changer is specifically designed for changing motorcycle and ATV tires with an outside clamping range of 6” – 24” and includes an Assist Arm to facilitate changing tires that are low profile and/or stiff sidewall. Rim Width: 1.5" - 20"
The K&L MC205 Wheel Balancer incorporates the latest advancements in state of the art motorcycle wheel balancing. K&L’s New MC200 Elite Hand Spin Wheel Balancer. 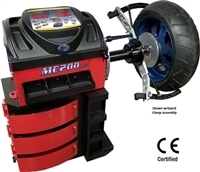 The MC200 Elite is a high quality, high performance balancer you can depend on for years to come. Formerly the 700, this wheel balancer offers your customers a great way to add new revenue to your business. The wheel balancer for service stations and garages with small tire service volume - combines high accuracy with small footprint. The K22' shaft is fixed so that the wheel rotates freely on its own bearings. Rim Diameter: 10" - 30"
At the point of sale, tires must be fitted to wheels with meticulous care and accuracy. That’s where we can help. Our selection of motorcycle wheel balancers includes a variety of best-in-class equipment at affordable prices. 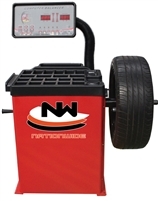 Nationwide wheel balancers are self-calibrating and dynamic with static or alloy capability. These state-of-the-art machines allow multiple operators to split function and perform diagnosis with ease. Their deluxe model is highly accurate, reliable, and designed to accommodate large rims up to 28 inches in diameter and overall wheel diameters up to 44 inches. K&L motorcycle wheel balancers incorporate all the latest industry advancements. We offer economy models with a spring-loaded quick clamp wheel-mounting package that offers static balancing, as well as keypad data entry with in-house calibration and an array of display modes. 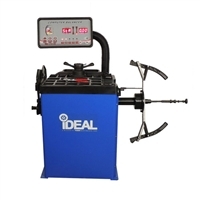 Their hand-spun wheel balancers are designed for any size shop and will accurately balance motorcycle, automotive, or light truck tires with ease. Best of all, they come with built-in tool boxes and are available in multiple colors. Motorcycle wheel balancers made by Talyn include digital-sensor technology that is accurate to within hundredths of an ounce. Coats balancers are best for low-volume balancing of OE fitments. Hofmann balancers are built for service stations and garages. CEMB balancers are engineered to eliminate all assembly inaccuracies. We also offer interest-free financing for up to six months on select models. You can submit your financing application without any obligation to buy! If you have any questions about this product selection or would like any assistance, please contact us today.